New York Business Law and Intellectual Property Attorneys. Experience and Sophistication With a Boutique Firm Approach. 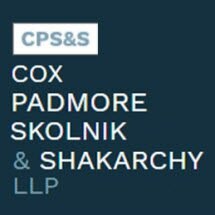 The skilled attorneys at Cox Padmore Skolnik & Shakarchy offer experienced representation and strategic guidance to individual and business clients in the United States and worldwide seeking custom-tailored services and creative, cost-effective legal solutions to commercial and entrepreneurial challenges. We understand that even routine business matters may play a crucial role in the growth and future prosperity of your enterprise. We are vigilant, proactive and thoroughly prepared at all times to take decisive action to protect your rights and interests and to help you take full advantage of developing opportunities. Contact us today to learn more in an exploratory consultation. Locations In New York City, Colorado, Jerusalem, Great Neck, NY or Hackensack, NJ. Call our Manhattan office at 866.716.3813 for scheduling worldwide. CPS&S represents corporate interests in North America, Asia, Africa, the Middle East, Australia, Europe and Latin America (especially Brazil). We understand international business customs and laws, and we understand what is expected of U.S. based companies operating abroad. In both the international and domestic arenas, the accomplished and dedicated business lawyers and staff at CPS&S appreciate that our most important role is to help clients address immediate legal needs while also pursuing the attainment of long-range personal goals and business objectives. History of Success In Entrepreneurial Business Legal Matters. Our long history of success is centered on an interdisciplinary group of experienced attorneys whose primary focus is handling complex commercial legal matters. Since 1971, Cox Padmore Skolnik & Shakarchy and our predecessor firms have provided a wide range of entrepreneurial, business and individual clients with competent, efficient and personalized legal guidance and representation.